Virgin Islands Hotels... "so where should we stay?" That's a question I hear a lot. The variety of Virgin Islands hotels, resorts, and other accommodations can seem overwhelming. But when you think about it for a minute, you realize that's a good thing! After all, it means you have lots of different places to choose from on your visit to the Virgin Islands. 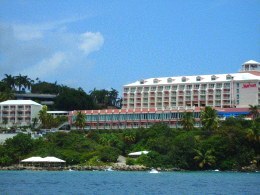 For a guide to medium and large St Thomas Hotels, click here. For a guide to small St Thomas hotels and inns, click here. For St Thomas Luxury Resorts, click here. For a guide to hotels on St John, click here. For condos on St John, click here. For St John private homes and villas, click here. For a guide to hotels on St Croix, click here. For condos on St Croix, click here. For a guide to private rental homes and villas on St Croix, click here. To keep things simple, let's look at the different kinds of accommodations in the Virgin Islands. Your choices in places to stay include Virgin Islands hotels, mega-resorts, and condominium resorts. You'll also want to consider the high-end "boutique" resorts, private villa rentals, and private condominiums. You can even stay in a campground! So, what's your preference in Virgin Islands hotels? Do you want to stay in someplace small and intimate? Or a mega-resort where every activity and service is at your fingertips and you never have to leave the grounds? Or maybe you'd prefer a modest, in-town place where the restaurants, shopping, and nightlife are just a few steps away. You can also find a whole array of resort-style condominiums as well as private rental homes and villas. The first step is to decide what sort of place suits your needs, preferences, and budget. So let's take a look at a short overview of the different types, one at a time. For the purpose of this discussion, "hotel" means a traditional, company-owned property that rents rooms by the night or week. It can be part of a large, worldwide chain like Marriott, Westin, or Best Western, or an individually-owned "one-shot" place with just the one location. All will have at least basic services (such as housekeeping, concierge, room-service, etc.) The larger resorts will have the entire gamut of services including restaurants (often several), watersports center, nightly entertainment, and so on. They range from enormous to medium-sized to small, modest places with just a handful of rooms. The prices range tremendously. A small, in-town place can be quite modest, while the big beach-front resorts tend to be quite pricey. Of course, in the off-season, prices generally drop anywhere from 20% to 60%. A lot of Virgin Islands hotels and condo developments call themselves "resorts", but what I mean by "luxury resort" is a large, posh, self-contained hotel or complex that has a wide array of services on-site. That means restaurants (usually more than one), gym/fitness center, swimming pool(s), gift shop (and, often, other stores as well), watersports center, concierge service, shuttle service, and so on. In general, these are the priciest of all Virgin Islands hotels. Room prices are typically several hundred dollars to upwards of a thousand dollars a day. To learn about St Thomas luxury resorts, click here. These may or may not fall into the category of "resort" as I defined it above, but they are run like hotels. These kind of condo resorts are definitely worth checking out; they often have an excellent array of amenities for the price you pay, and offer good comfort. To learn more, check out this discussion of Virgin Islands condo resorts. For a guide to condo resorts on St John, click here. 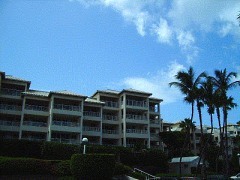 For a guide to St Croix condo resorts, click here. These kinds of properties vary from relatively modest, with standard hotel services, up to quite luxurious. They may or may not have a restaurant associated with them, and the same is true for levels of other services like watersports and on-site entertainment. Typically, these hotels will be in locations that aren't as sumptuous as the big resorts (but that doesn't necessarily mean that they're not pleasant). The in-town hotels of Charlotte Amalie, Christiansted, and Frederiksted generally fall into this category. The less luxurious places are still generally quite decent, and offer some of the best prices of any Virgin Islands hotels. For a more detailed discussion about these small and medium sized hotels, click here. There's a huge range of these types of places available. You can find everything from simple, modestly furnished condos up to amazingly lavish, huge luxury villas in spectacular locations. The prices vary accordingly, with the high-end villas renting for tens of thousands of dollars a week! These are the kinds of places that celebrities and very wealthy folks rent. But don't be intimidated; there are plenty of less expensive choices available in this category. Renting a private villa or condo is often an excellent choice for people traveling in groups (for example, several couples traveling together, or one or more families sharing accommodations. Generally, you find these kinds of places through one of several rental agencies that specializein these properties. Click here to learn about private house and villa rentals on St John. For St Croix vacation rental homes, click here. There are several of these around the islands, and they vary quite a bit in quality and appeal. There are some very charming inns and B&B's as well as a few inexpensive, "bare-bones" guesthouses with limited services for the budget-minded. Yup, you can even stay at a campground in the U.S. Virgin Islands! There are several on St. John and at least one on St. Croix. Depending on the campground, you'll get either a platform tent-cottage, a bare campsight where you pitch your own tent, or a rigid-walled, semi-open cottage. Camping is almost certainly the cheapest kind of accommodation in the Virgin Islands. Of course, you don't enjoy the same conveniences as at the Virgin Islands hotels, villas or condo resorts, but the campgrounds are still very appealing, since they put you "close up and personal" with the beauty of nature. Go here to learn about Maho Bay Campground on St John.